Get Thee to a Theatre! If you haven’t seen Twilight yet, you simply must rush out and see it NOW! The movie was better than I expected, as I am rarely pleased with movies based on my favorite books. They never quite live up to the original. In the case of Twilight, though, the script was true to the novel in virtually every detail, so if you loved the book, you’ll adore the movie. Despite some negative reviews from those who have not read the Twilight series, the movie did what it was supposed to do–it transferred the book into film beautifully, including the characters. Prior to seeing the movie, I was not sure I “bought” Robert Pattinson as Edward, although Kristen Stewart seemed perfect as Bella from the start. After seeing the movie, however, Robert Pattinson is Edward. He was as gorgeous as Bella described him in the book; even though I’m old enough to be his mother, I could still detect the hotness. Peter Facinelli was a bit too pale as Carlisle–maybe if his hair hadn’t been so white, too–he was like looking at a blizzard. Carlisle’s albino-ness aside, the movie features breathtakingly beautiful scenes of the Pacific Northwest and an honest interpretation of the book that will have Stephenie Meyer’s fans clamoring for the release of New Moon. Oh, didn’t I tell you? Summit Entertainment, the producers of Twilight, announced this week that they are planning a movie based on New Moon. No release date has been set. So we still have something left to live for, Twilight fans! Are We Going to See Twilight or Not? If you are available and you have your own ride and money to go, please email me immediately. According to fandango, the matinee shows are $7.25 and the evening shows (7:00pm and later) are $9.50. I thought it might be kind of fun to dress kind of vampire-y. If you promise you are going, I will get tickets in advance on fandango so we will be assured of having seats. Whatever time has the most people available will be the time we will go. We will still need to arrive early to sit together. Again, email me ASAP if you are available. The poll answers don’t really count because anyone can vote on the poll. Only the email votes count. Give It Up For Forks, Washington, Twilight Fans! OK, so the characters in Stephenie Meyer’s Twilight series might not be real, but the town of Forks, Washington really is real. And Stephenie’s fans are coming to see it in droves. The timber business in Forks was drying up, and everyone thought the town was dying until the series breathed new life into the area. Now visitors come from all over the world to visit houses that are staged as Bella’s and Edward’s. The police station poses as the one where Bella’s dad works, and the hospital not only plays its part as Dr. Cullen’s workplace, it even has a parking space for him! 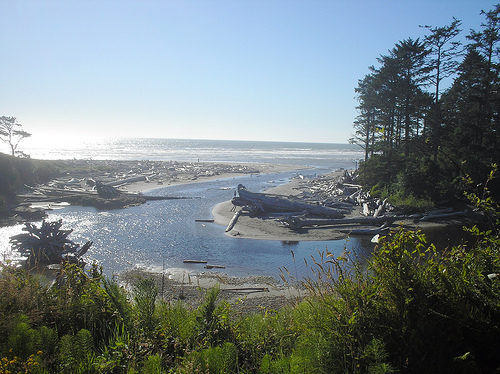 The most popular spot in Forks is the nearby beach at LaPush, the spot where Bella finds out the shocking truth about Edward. Amazingly, Mrs. Meyer had never even been to Forks before she wrote Twilight, but like a good library student, she did her research, and got a lot of the details right. Go research! For more details, you can read a story on CNN. Don’t Be Wrong About Copyright! You know how Ms. Hamilton and I whine and whine about copyright violation to you, but now you have the opportunity to see for yourselves how harmful it can be to someone you “know” when her rights are violated. Stephenie Meyer, author of the Twilight series which many of our Blatant Bibliophile Creekview readers love, had her heart broken last week when someone she trusted had a partial draft of her latest book, Midnight Dawn, published on the Internet. The book was distributed online without Ms. Meyer’s permission, leaving her so disappointed that she no longer has the desire to finish the book. She’s even embarrassed, because the draft wasn’t fully edited and was not up to her usual standards of perfection, so those who do read the draft will probably be disappointed. She worries that if she does try to finish the book in her current state of mind, the series might have an unhappy ending, and who wants the bad guys to win? Copyright is important, and this is a great example of why. Just because you buy a copy of a book or a song or a DVD, doesn’t mean you have rights to make copies or distribute it. Only the creator maintains those rights, which is only fair. Some day when you become a famous author, song writer, or filmmaker, you’ll appreciate people respecting your rights, too. At long last, Breaking Dawn, the fourth entry in the Twilight Saga by Stephenie Meyer, was released Saturday, August 2. The media center used some of our money from Governor Sonny Perdue to purchase four copies for the library. Be sure to stop by to check out a copy if you haven’t purchased one for yourself already. If you aren’t one of the first four, you can reserve a copy to be next in line. Visit Stephenie Meyer’s website for more info about the book, the series, and Ms. Meyer. Readergirlz are on the runway this August with author Melissa Walker’s Violet series. Walker’s books Violet on the Runway, Violet by Design, and Violet in Private examine the topics of fashion, fame, and finding your authentic self. 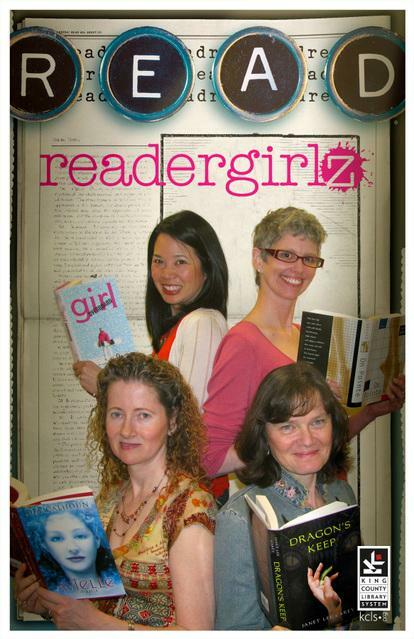 On August 28 at 9 P. M. EDT, you can chat live with Melissa on the readergirlz chat at their myspace group forum. 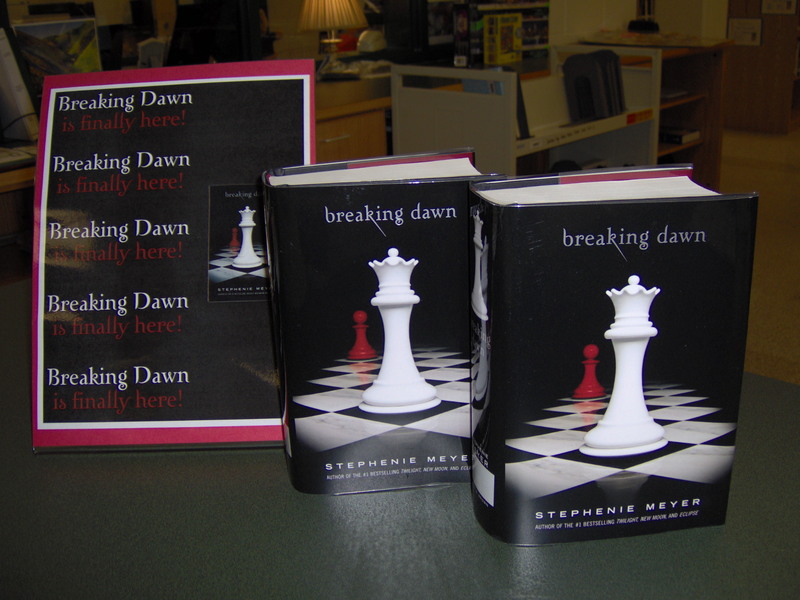 Also in August, celebrate the release of Stephenie Meyer’s latest addition to her Twilight series, Breaking Dawn. 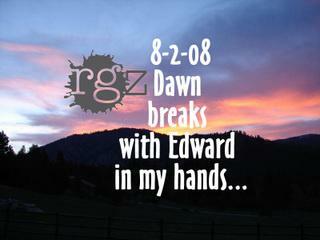 Be one of the first twenty posters on the readergirlz designated thread celebrating the August 2 release of Breaking Dawn and win their brand new readergirlz designer button and Edward button! See the Edward button below! Check out the their zazzle store for an early peek at their awesome merchandise!